The most prominent of these violations was a visible one, the erection over the great gate of the Temple of a huge golden eagle, this a clear trespass of the Jewish aversion to the representation in the arts of a living being, for such a representation was kindred to idolatry, and especially so in view of the prominence of the eagle in Roman temples and on the standards of Roman troops. Since the report was widespread that Herod was dying, the occasion was ripe for an uprising. 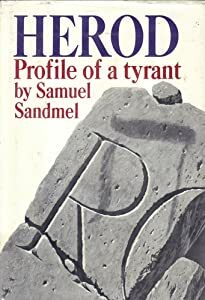 The eagle, representing both the power of Herod and also, remotely, the god Zeus, the chief of the Greek pantheon, served as the focus for an insurrection. Two sages, Judas the son of Sepphoraeus (also spelled Sariphaeus), and Matthias son of Margalus, used the occasion of their lectures on Scripture to young men to denounce the presence of the eagle on the Temple, and to stir the students to remove and destroy it. verge of death, and that they were mistaken to he defiant and even exultant. "We shall enjoy even greater happiness after death." COPY OF THIS VERY INTERESTING BOOK. (INCLUDING THE OFFENDING ROMAN EAGLE).